According to Dawn Zuppelli, videographer and journalist with Rochester Indymedia, there was a gatekeeper in the entrance to the union hall checking press credentials. "What media are you with?" the staff asked. "You're not allowed in today," said the staff member. "Why is that?" Zuppelli asked. "It's obvious; about the death threats," he stated. "Indymedia doesn't allow threats on our site," she said. "You wanna argue about this? This is private property; I can mail you a statement," he stated. "Do you have a statement you can give me now?" requested Zuppelli. "No. I can mail you a statement!" Zuppelli and her associate then left the premises. Had Rochester Indymedia been granted access to the union hall, we would have asked some of the following questions based on Mazzeo's statement. Questions like: Are patrol cars equipped with dash cameras and if so, why haven't we seen video with the other alleged people in the car? Are the police suggesting Ms. Good broke down her own door with a battering ram to steal her own Ipod? Does Officer Masic have any previous complaints against him? What proof do the police have that they were being directly threatened? Hypothetical questions aside, one thing is clear watching the press conference: the police union president decided that perpetuating lies would be the reasonable thing to do. 1) There were three people in the car, not one. 2)That Good had some kind of connection to the man that was handcuffed after being pulled over when, according to someone ”we're not sure who" Good is supposed to have said, "These are my friends, what's going on?" and 4) Videotaping was not the basis for the arrest. As to the first point, it doesn't matter how many people may or may not have been in the car; stopping someone because of the color of their skin, whether or not the person is on a police list, or because of past criminal history, is illegal. It is a violation of the individual's constitutional rights as well as their human rights. On the second point, Good maintains that a)She does not know the person(s) caught on the video and b) that she never said anything before the I-pod began filming. It was officer Masic who engaged her first with his "Hey, you guys need something?" On Mazzeo's third point; that Good was arrested for failure to go into her house and that she was too close to the officers. The video and the police report clearly contradict that she was in any way obstructing the officers from doing their jobs and by extension that the order was unlawful. According to Masic's arrest report, that has been widely reported on, the officer wrote that Good was at least 15 feet away. She was not antagonizing officers; she was in her pajamas, barefoot, standing on the far side of the sidewalk on the edge of her front lawn. It's curious that Masic in his opening salvo acknowledges that Good is standing with someone else and that Ryan Acuff, the person standing next to Good during this whole experience, is never questioned at all--he seems completely ignored by police. Acuff was in his regular clothing standing next to Good when the arrest happened. He's also a bit taller than Good and would appear to be the bigger threat if indeed officers, as they've been claiming, felt unsafe. The third point leads into the fourth; that the police did not arrest Good for taping. If this is the case, why was she directly targeted? Again, police paid no attention to Acuff. So if the order was to go into the house because the scene unsafe for them, then why wasn't Acuff, her "associate" according to Mazzeo, also targeted and told to go inside. Why were the neighbors who saw the whole thing happen not told to go inside? The officer behaved unlawfully, violated someone's rights, and now the police union is trying to defend this officer's abusive actions. The District Attorney's office agreed that there was not enough evidence to prove the charge of obstruction of government administration and withdrew it. A few other points that should be addressed: the first is that the video we have on youtube.com/user/RochesterIndymedia of Good's arrest is the uncut video from the night in question. Nothing was edited from the time the camera was turned on until Good was taken into custody. Another important point is that officers seem to be getting training regarding how to dissuade the public from getting potentially damaging video of their abuses. The officer's continued mantra of "I feel unsafe" almost sounds like their mantra of "Stop resisting!" when arresting a suspect (whether they are resisting or not.) Office Masic deliberately issued a misdirecting comment that Good said something before she turned on the camera to incite the officer to tell her to go into her house. This can only be viewed as a tactic to misdirect some members of the public into believing that Good had other "motives" when she started taping in front of her home. Finally, there is Mazzeo's "most intriguing question. " He insinuates that Good broke down her own back door, stole her own I-pod, and therefore stymied the police and public from seeing the "unedited" video with the "gotcha" moment they claim justifies everything Masic did. Good has stated that on the day of the break-in, she felt watched, she was at the library around the corner from her home for an hour, and that when she came back home around 1PM and saw the break-in, she called 9-1-1 and within 25 minutes eight police cruisers and a technical van appeared out of nowhere. The police tech took a few photos and gave a limp reason why he wouldn't take fingerprints. Neighbors have corroborated that break-ins of that kind rarely if ever happen and that it usually takes much longer to get a cruiser to a house because of a burglary--let alone eight cruisers and a tech van! The other questionable thing about this, is that it was the same day four cruisers appeared at the Flying Squirrel Community Space during a meeting to plan support for Emily Good's case. The police issued three tickets to drivers ”who were attending a meeting at the community space” for parking more than 12 inches from the curb. People at the meeting felt this was intimidation and harassment. Mazzeo thought it was good police work. Rochester Indymedia did post the officer's name, photo, business name, and business email address in one of our feature pieces. We did not post any other information about him. This information was made public by Masic himself (on his public website) and was disseminated nationally by Carlos Miller's website Photography is Not a Crime. 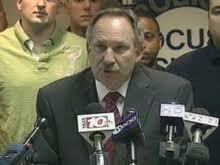 Only after the actions of officer Masic came under scrutiny did he hide this information. "Too many times we have seen police departments not release the names of these officers - even though it should be public record - so they could just sweep it under the carpet. However, if you get arrested, your mugshot [and even home address] is considered public record and some police departments even post the mugshots on their sites, even though you have not been convicted. So considering this officer took it upon himself to make an unlawful arrest - which is clearly proven by the video - I have no qualms about making the information that is already public available to my readers," Carlos Miller explains on his Facebook page. In Good's case the police released her name, mugshot, and address to the media immediately after the video in question began circulating. Miller goes on to say; "We're living in an age where we, the citizens, have a lot of power because we are all self-publicists. This is a right guaranteed by the Constitution, but it was only until recently that we truly had the ability to be self-publicists. We obviously can't depend on the cops to police themselves. That hasn't worked. So now it's up to us to police the police." Rochester Indymedia agrees with Miller's rationale and will not remove information about this officer so that he can hide in anonymity from the public. Rochester Indymedia was concerned but not surprised to hear about the alleged death threats that some Rochester police officers have been receiving around this case. Rochester Indymedia has a very clear editorial policy regarding threats: "The IMC newswire is not intended to be a forum for publicizing hate nor for making direct threats against individuals, groups or classes of people." We are very upset about the police abuse and misconduct both within the Rochester Police Department and around the country. It is the responsibility of the police department to behave lawfully and to uphold constitutional rights. This specific situation is an opportunity for members of the police department and city officials to engage in discussions that de-escalate and address residents concerns around police misconduct. Unfortunately, thus far, instead of taking responsibility for the illegal arrest shown in the video, the RPD have been using intimidation tactics in an attempt to silence concerned community members. Rochester Indymedia will continue to report on this case and others like it. We encourage the community to use Rochester.Indymedia.org as a tool to expose police abuse and organize communities to fight back. Our readers are welcome to post video, photos, and stories of their experiences, anonymously if necessary. No justice, No peace!